I’ve never been much of a shopper, but I’m really good at buying food and all kinds of kitchen equipment. And since I started to blog about food, my interest towards plates, cups, cutlery and whatever that’s pretty and can be fit into a photo with food has gotten onto a whole new level. And I think that’s pretty clear if you’d take a look into our cupboards. If we’re looking for someone to blame, I think it’s the mini closet we have in our kitchen, that offers way too much space for my impulse buys. In the beginning I was able to step in and stand inside the closet, but lately my things have taken over the floor space too. Whoops..
Oh well! I’m not going to blaim myself for buying that stuff, as almost all of it is actually really useful. The plastic things are unnecessary, but for example my mandoline, juicer and the newest add – spiral slicer – were impule buys but they’re my total favorites and they’ll definitely last long. The point of this story about our kitchen closet was to tell about the great find from the top shelf: my waffle maker. It’s always love at first sight when I remember that it exists. 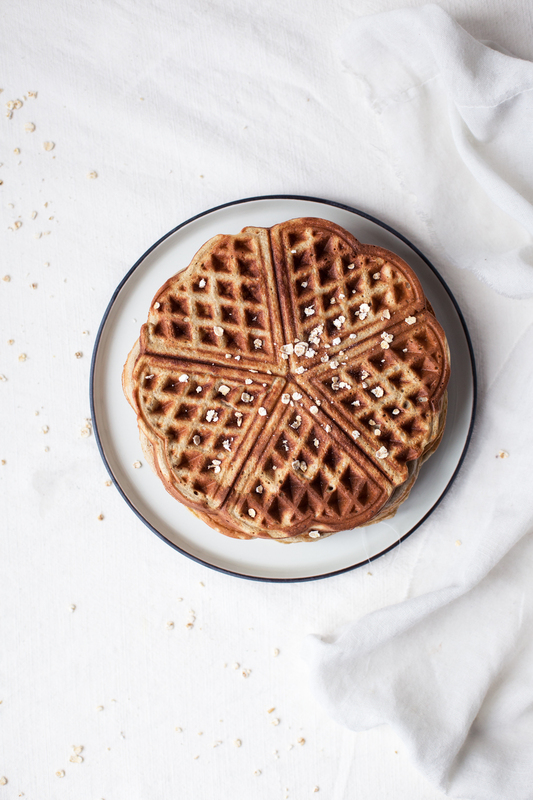 ‘Cause really, is there anything better than waffles? 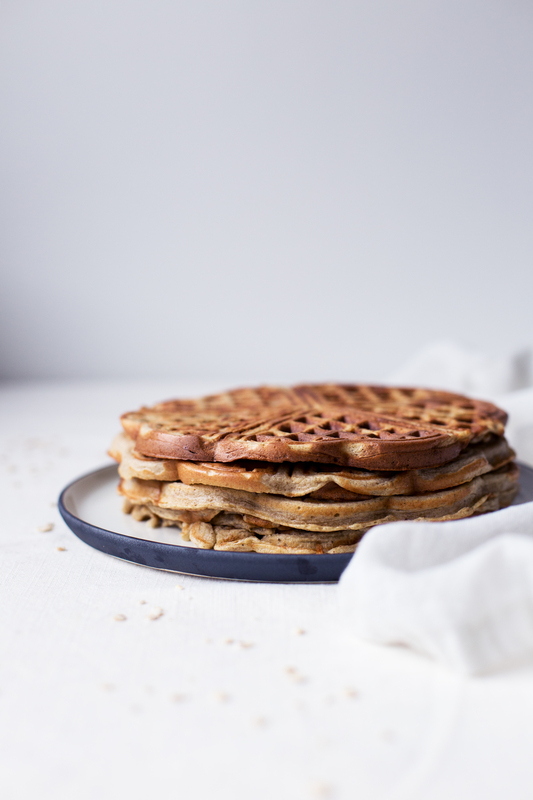 This waffle recipe is one the few ones I’m making for Urtekram this year. The theme for this month was flakes, and I chose to bake with two of my favorites: oat and buckwheat flakes. I’ve been a fan of the company’s products for long, as they’ve got loads of high-quality, wholegrain gluten-free products, and a lot of them are organic too, which I love. Instead of stacking my pantry with separate bags of flour and flakes, I like to buy only the flakes, as they’re good for a lot of things, and then if needed, I make my own flour by grinding the flakes into flour in my blender. Easy, affodarble and space-friendly! This time I turned my flakes into a waffle batter. 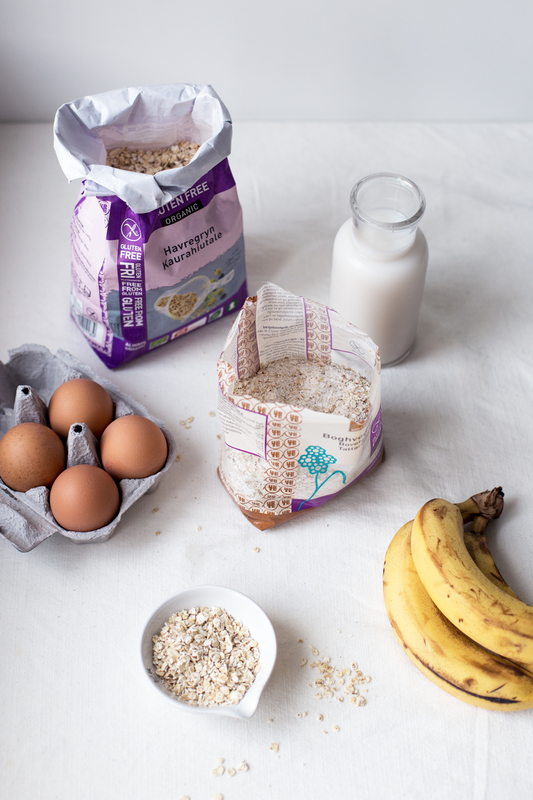 Besides oat and buckwheat, I added a few eggs and couple bananas to bring some texture, protein and sweetness. The waffles turned out delicious and filling, so they’re totally acceptable for breakfast. 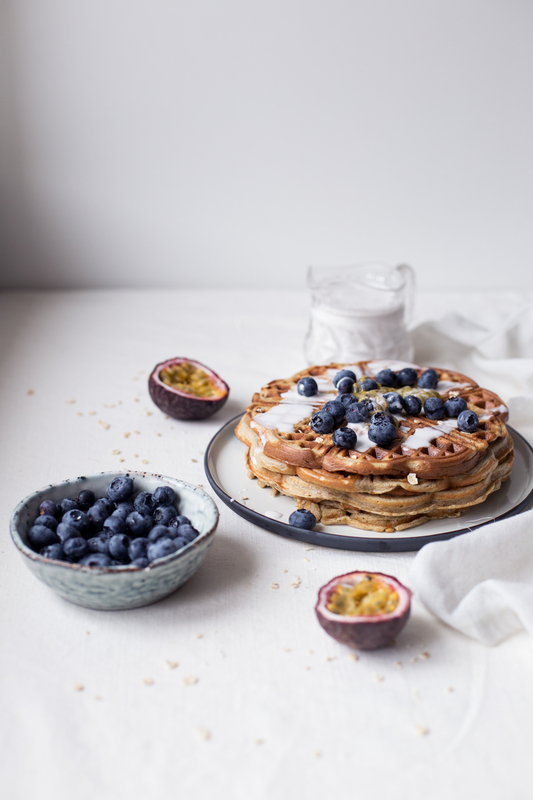 And to bring some spring vibes to the table, I savored mine with blueberries, passion fruit and coconut milk – total perfection and balance of flavors. And totally okay for eating a few days in a row. 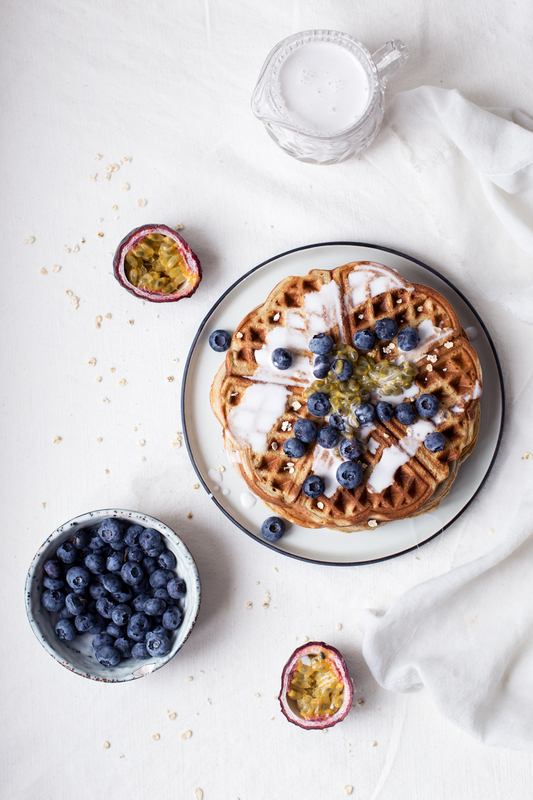 So to give myself a pat on the back, I’d say these gluten-free breakfast waffles are the perfect excuse for owning a waffle maker, even if it’s sometimes forgotten to the depths of the closet. 1. Chop the bananas into a blender or a food processor. Add all other ingredients and blend until smooth. The batter will be quite thick. 2. Heat your waffle iron on a medium-high setting. 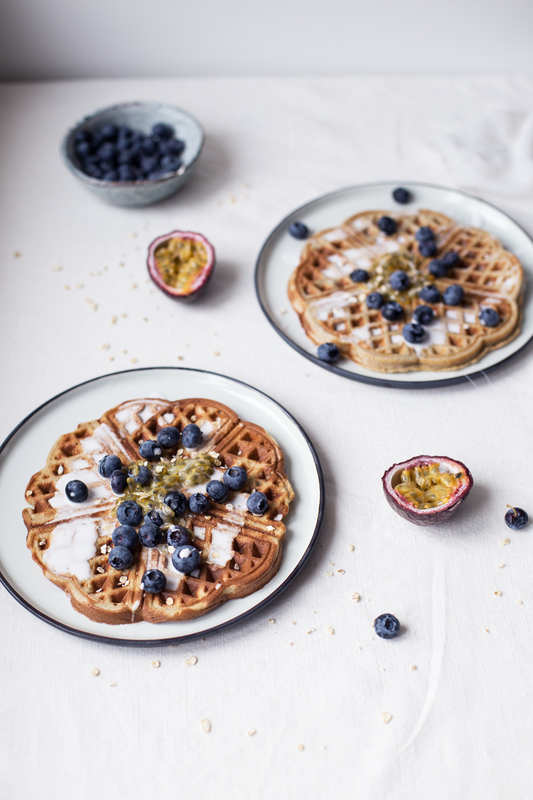 With the help of a pastry brush, brush the waffle iron with coconut oil and pour a few tablespoons of the batter onto iron. Cook for about 3-4 minutes, or until golden brown. Repeat with the remaining batter. 3. Serve warm with passion fruits, blueberries and coconut milk and enjoy! Store leftovers in the fridge and heat in the waffle iron or in the oven before serving. Tagged baked goods, breakfast, nut free, spring, waffles. N'Ice Cream – Breaking the News! Big, creamy, fantastics news are finally here – and they involve lots of ice cream! Tasty Sweet Potato Toasts with Avocado Pea Mash, Feta and Eggs are great for breakfast or brunch – they're healthy, filling and make you feel good! This looks so good. What waffle iron do you use? Great idea about storing flakes and milling only when needed.